Cowls are awesome. It's like all of the warmth of a scarf, combined with the funky look of a crochet turtleneck sweater (but with, like, 1/10th of the work), AND it also counts as your jewelry, ya know, if you do it right. 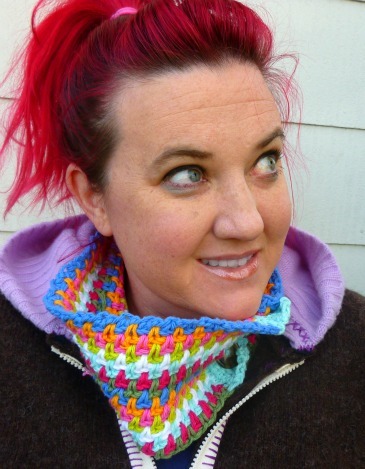 I didn't realize how much I needed one, until my friend Darlene asked me for some cowl suggestions. And while I was inspired by the round-up of cowls that I did last week, none of them exactly spoke to my personal crazy style and I wanted to make one just for me. 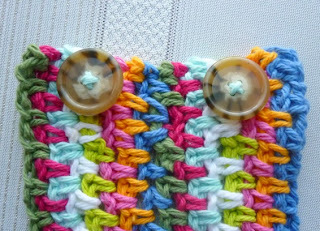 I really liked THIS as a cowl idea (not a pattern, but definitely an inspiration source), but I wanted one that would button. So this is my Dynamite Cowl. 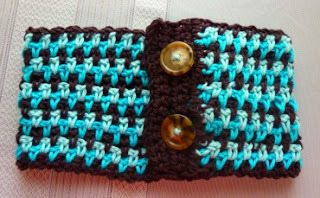 I used the moss stitch, which made it go crazy fast, since you crochet into the ch spaces, not the stitches. Awesome, right? If you want to make one too, read on! Sew buttons on to the other short side, being careful to match them to the button holes on the button flap. Button it up and enjoy!! And, in a pinch, you can use it as an earwarmer/headband. You'll be the cutest ski bunny or Shred Betty on the block! So, which do you like better? Would you wear the crazy multi-colored cowl, or would the more sophisticated colors make you happier? Thanks Renee! It's surprisingly warm! LOL!! Hi Pam! Thanks! Me too. Muchas gracias. Feliz año nuevo para ti también! Fabulous pattern! 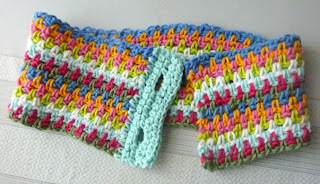 Great way for me to use my scrap yarn stash from other cowl projects. Thanks! YES!!! 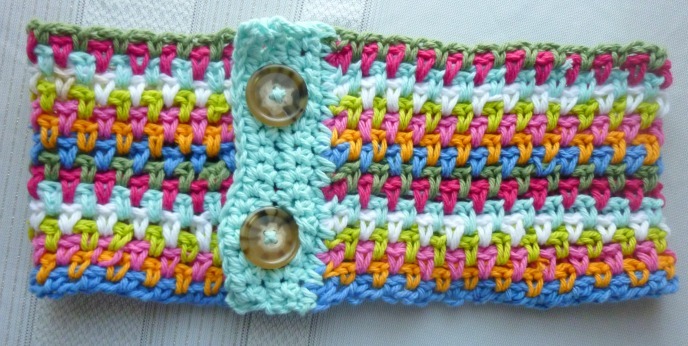 It wouldn't even matter if you used your little scraps, and switched colors mid-row. Perfect scrap project!! Hi Lois! Thanks so much!! Hi Lauren! I know, right?! I'm lovin' the moss stitch right now. I agree with you about the color changing and end weaving. It's a pain... LOL!!! Holy Schmow, kid, you've been busy! I'm so glad that they turned out so well!! Hi Deanne! I'm so glad you found me! I hope to see you around lots more!! I like them both, but I love the funky-colored one the best -- makes me happy! 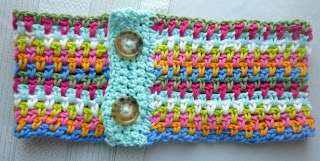 I think I will try one with my leftover "crazy-lady bag" yarn, now that I'm off vacation, back to work, and commuting again (the only time I have for knitting/crocheting, when it's my carpool-partner's turn to drive). OOh! 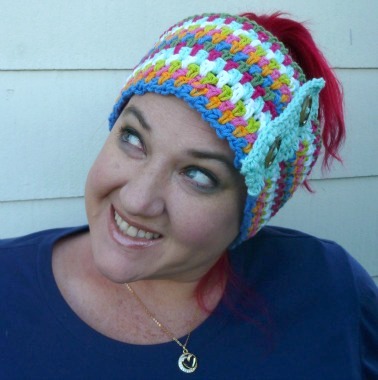 Crazy Lady Cowl!!! It needs ruffles on the edges! LOL!!! Yes! Get over the plague and come over!!! And bring that cute kid of yours!